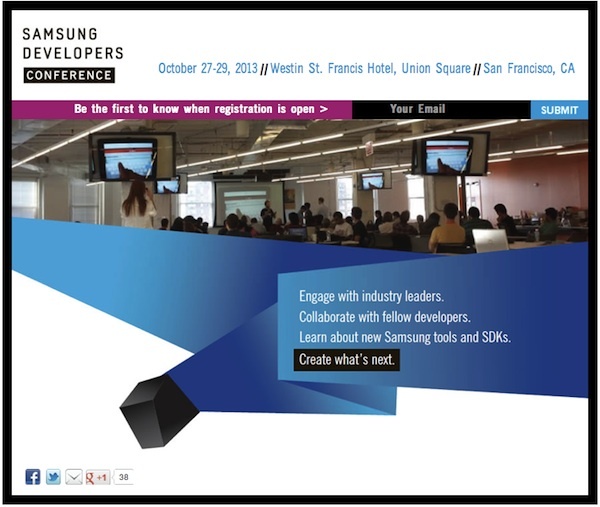 Earlier today, consumer electronics giant Samsung announced a cross-platform developer's show, Samsung Developer's Conference , or SDC. Scheduled to take place October 27-29 at the Westin St. Francis Hotel, Union Square, the event is being billed as a cross-platform event that will cover topics including their Android-powered Galaxy smartphones and tablets, Windows PCs, Windows Phone smartphones, and even their SmartTV and Boxee offerings. If I was Larry Page, I'd be more than a little worried that my largest Android partner is "going rogue." Bottom line: still looks like Samsung can't come up with any original ideas.